I was nervous, like a girl going to see her ex-boyfriend. The trepidation that this probably isn't a good idea filled every empty space within me. It had been two years. I was over it. I had moved on, made new friends, redefined my life. But then the opportunity presented itself, and it was too difficult to say no, because there is a part of you, isn't there, that is always curious? And then the real question: am I really over it or did I move on because it was no longer an option? But the pain wasn't a distant memory; it was hiding behind the new layers of recollections I was creating day by day. And that lurking pain made itself more and more known as I got closer and closer to Rome. Getting off the plane was like walking those last steps into a restaurant before spying your rendez-vous. The trembling of your fingers, the quivering of your voice, you know you are scared, but it is too late. And you are afraid to admit that maybe you are even a little excited. And then you see him, and you know why you were scared. You're still in love. The emotions rush back like a tidal wave and you know there is nothing to do but let them wash over you. You made this decision. You are here. There is no where to go but forward now, dealing with the consequence as they may come. I have missed you. And from the subtle ways that she shows it, I know Rome has missed me too. She had put on her best outfit: the sun was brightly shining, perfectly painted light, blue skies, a warm and breezy day. And she was on her best behavior: The trains and buses came on time, the machines all worked, the people all friendlier than I ever remembered. Her perfume of caffe and pane caldo wafting through the air... Yes, she had missed me. I could tell. It wouldn't stay like this of course. The excitement, the shiny facade, the aura of perfection would all fade away within a few short days, but for now, we enjoyed each other. It was the right decision to be together again. Heading over to Europe, I thought it a wasted opportunity not to visit my sister in Ireland. Though I had been once before, I had gone in November and stayed almost exclusively in Dublin. This time I intended to do day trips and soak in the lush hues of springtime green for which Ireland is so well known. Here are some highlights from my trip and some tips on what to do in Eire. Flying is not my favorite thing in the world (paradoxically). However, Aer Lingus with its comparatively spacious seats, nice crew and private TVs was a great experience, heightened by the fact that the plane was at max 50% full so each passenger had a row to themselves... maybe not a good thing for the airline, but a great thing for the customers! Self explanatory. Ireland seems to make most of spring by planting gorgeous flowers of vibrant colors. Howth is a lovely little bayside city just about thirty minutes north of Dublin on the DART train. It definitely has a seafaring feel, and if you want seafood, it is the place to go. Seafood chowder is omnipresent on menus in Howth with rich portions of oysters and prawns from the bay. Essentially, most seafood can be bought or eaten in Howth, and as one well-known shop, the Wrights of Howth, puts it: "If it swims, we have it." The wide variety of fish in the bay is also likely the reason for which seals have found a home in waters around Howth. Though signs forbid it, people feeding the seals, sadly, have made them quite prone to hanging about the docks waiting for their next meal. It makes for a nice viewing of the seals, but it is an upsetting thought that these seals may have become dependent on visitors, and not on instincts, for their food. Dame Alice, a beautiful lass, had three husbands and a lot of money, and therefore, made a lot of townsfolk jealous. She was charged with witchcraft, a crime punishable by burning at the stake, and though she was found guilty, she fled to England avoiding her fate. Her hand-maiden was not so fortunate and was in fact burned alive. Not a happy tale, but certainly an interesting one with various beliefs on how mysterious and demonic Dame Alice actually was. 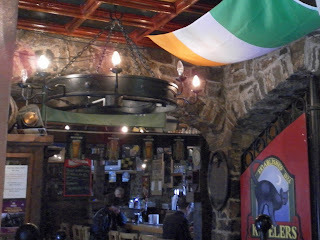 The milder version is posted at Kilkenny's Kyteler's Inn, now a pub, and her former property. You can go enjoy a beer (a Kilkenny beer if you so chose) and read about her tale in a much more favorable light than some other versions. 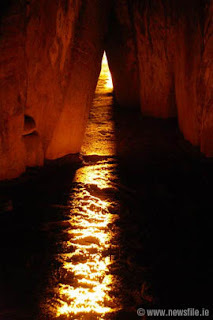 Newgrange is another location just about an hour north of Dublin. It is a mound that is known to be a passage tomb, but also likely an ancient temple. Very little is known about this Stone Age monument, but they do know that it was built around 5,000 BC, rendering it older than Stonehenge and older that the Pyramids in Giza. Crouching and winding through this narrow entrance into the main chamber, it is easy to feel that this was a vastly important structure to the people of that era. The stone carvings found on many of the chamber walls also reflect that, whatever these symbols meant, they were certainly spiritual. At dawn, from December 19th to 23rd, a narrow beam of light penetrates the roof-box and reaches the floor of the chamber, gradually extending to the rear of the chamber. As the sun rises higher, the beam widens within the chamber so that the whole room becomes dramatically illuminated. This event lasts for 17 minutes, beginning around 9am. There are usually about 25,000 applicants for the winter solstice tickets of which only 50 are chosen by lottery to witness this.... I will be one of the 25,000 for this year's. Friendly as you'll ever find in any country, the Irish people are one of the main reasons I love Ireland. I don't know any other place where a bus driver will see you running to get to the stop and realizing that you will never make it there in time, he stops to pick you up on the way instead. Most interactions with the people in Ireland could serve as another example of this amiability. 6. And for heaven's sake, have a pint of Guinness! Many places claim to serve the best pint and without having Irish blood, I am not sure my taste buds can decree which is right, but I give my vote to Toner's, a small pub (snug actually) in Dublin, off of Marion's Square row. 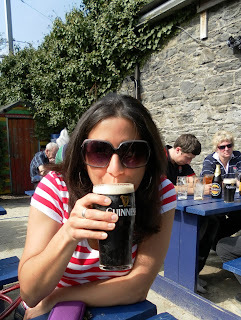 However, I have yet to have a bad pint of Guinness in Ireland, so bottoms up and as they say, Slainte! So after my last couple teary-eyed blog posts and my hard good byes, I was happy to be coming to the land of Oscar Wilde to enjoy some well-timed Irish humor. "If you want to tell people the truth, make them laugh, otherwise they'll kill you." (Oscar Wilde). Gotta love a good pun. Pretty classically Irish I would say. Not sure what the marketing industry would say about this one, but it is original! The Black-Eyed Peas would approve. What is your favorite Oscar Wilde quote? 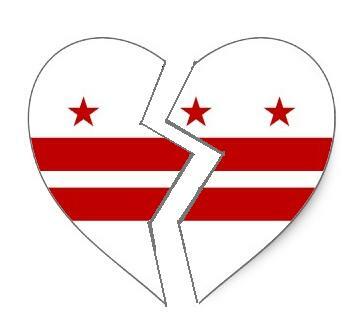 In my analogy of a city being like a boyfriend, I suppose these recent days have been the break-up phase. Our break-up is not acrimonious. There is nothing wrong really. We are just parting ways, needing to go in separate directions for now. That thought is dangerous though; you tell yourself, "Maybe we'll be back together someday... Maybe this isn't really a good bye." But you know deep down that it is. Because even if you find yourself back together, you have changed and the city has changed, and it may not be the fit it was before. That is the trick in life: being grateful for the times you have that are a perfect fit and moving on when it is no longer... hoping that eventually you find a person, city or job that will be dynamic enough to change with you, to carry that "fit" through life. Of course, the early phase of a break-up, you remember only the good times: the morning light in the apartment, the pink cotton-ball cherry blossoms not in the tourist areas but in people's lawns, the smell of empanadas from Julia's, the black squirrels scampering in the park in front of the White House. And before even leaving, nostalgia sets in and plays mind games: "Do I really need to leave? ", "Things aren't really that bad, are they? ", "What if we just stayed together a couple months longer?" ... thoughts that threaten to unravel the months of weaving that you underwent to make your decision into a tight, rational, cohesive ball of action. These prevalent thoughts at the start of a break-up do not get you anywhere. You know that they aren't productive and will not change anything, but there is no way to stop them. So you let them scamper through your mind like mice, letting them free and hoping that they don't start nibbling away at your real reasons for ending things. It's true that we had gotten into a groove and ironed out many of our issues: I no longer take the metro on weekends. We addressed the jealousy of traveling to other cities. I got accustomed to the constant security checks by voluntarily getting cleared. That's what happens with any relationship: you learn each other and it smooths the path. But then life presents itself in a way that reminds you of the underlying reasons for doubting the relationship to begin with, the differences that will not go away no matter how much you work on them: "We don't really want the same things out of life." And there comes a time when you have to face that statement. So despite the sweet memories, the beckoning Spring time, the smiles of friendly faces and hugs of new friends, for now, I need to venture on a new path. And like any break up, I am not sure that my new city will be any better. I am not sure that I won't regret my decision. I am not sure that I won't want a second chance, but I have to risk it anyhow. Thank you D.C. I'll remember you fondly and hope that we can remain friends.